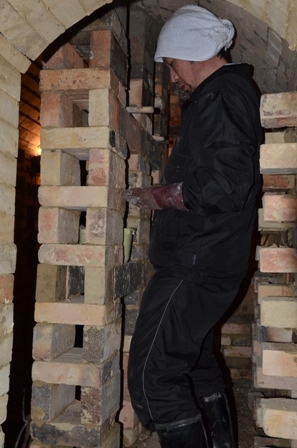 We have eight wood-fired kilns in seven types at our kiln site. 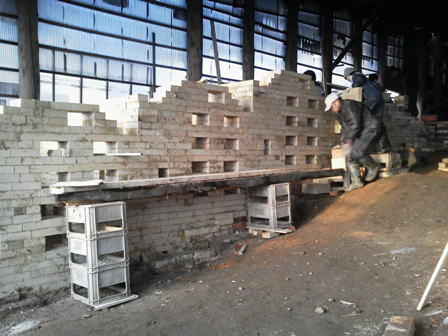 The maximum limit to use refractory bricks is usually about 150 times. 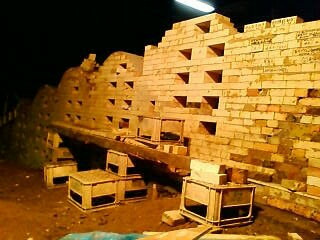 We often fire the kilns so when the 150 limit is reached we build a new kiln. 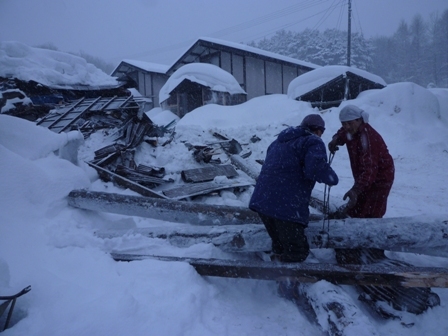 This happens between 7 to 8 years. 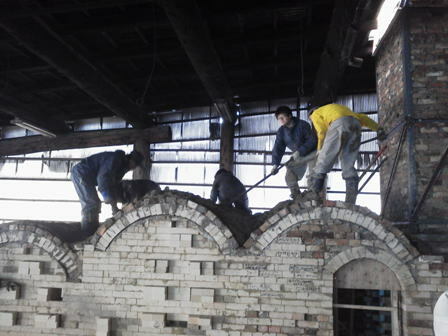 Next time we build a new kiln in the future, we will make regenerator to effectively utilize exhaust heat to produce electric power or other kinds of energy. 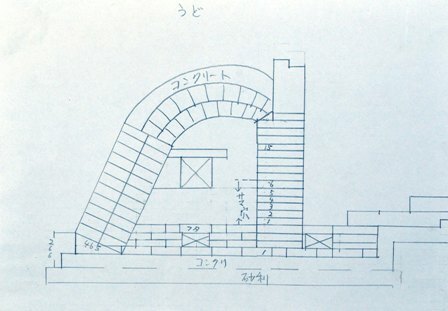 All of staff worked for building the kiln according to a design drawing by Senior Managing Director, Kudo. 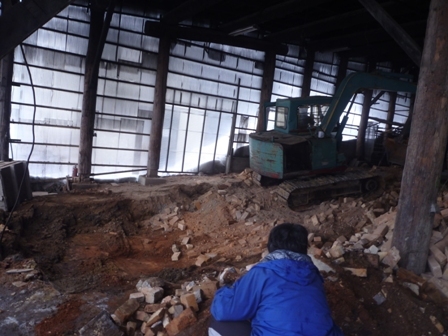 ▼Go to the last report. 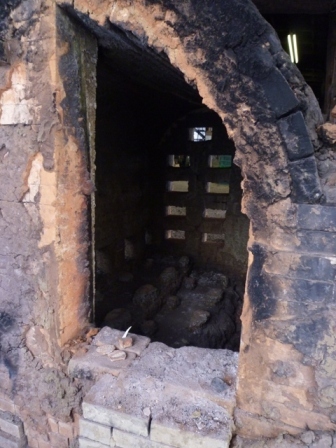 This was the old climbing kiln which kept working for 10 years. 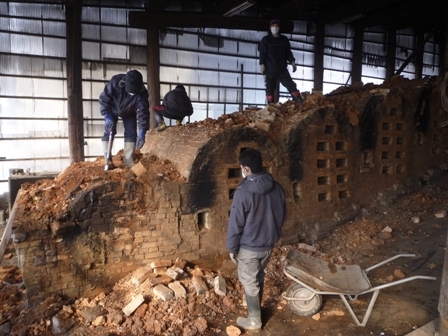 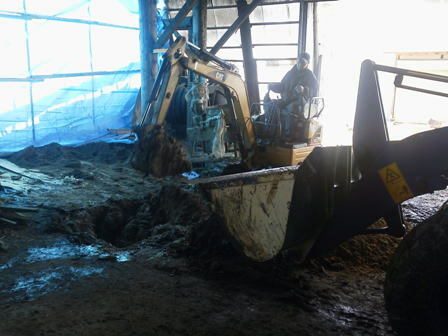 For preparing to break down the old kiln, we removed dirt which covered the kiln. 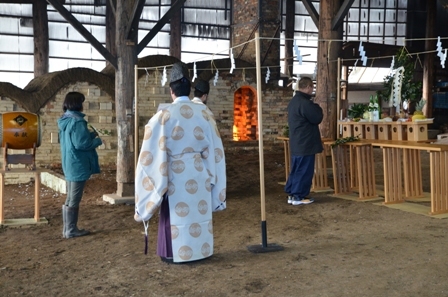 All of the studio staff went through a purification ceremony. 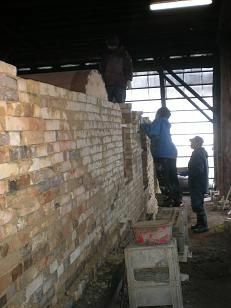 The old climbing kiln was broken down in one go with the heavy machinery. 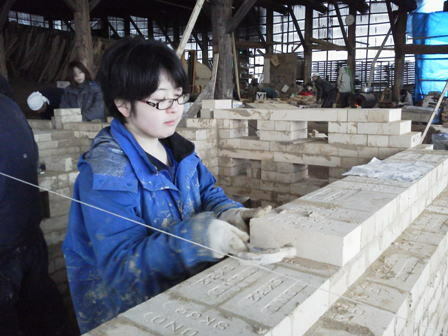 This “doing something in one go” is “Tsugaru Kanayama way. 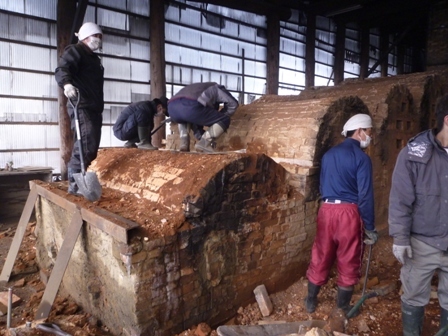 The old kiln was broken down in half-day. 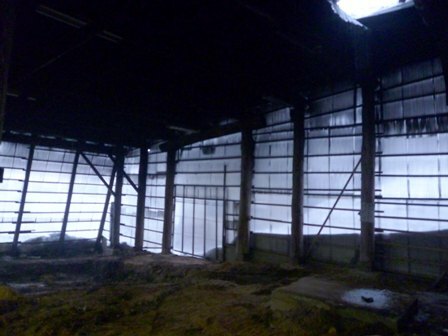 The roof had a gaping hole in it. 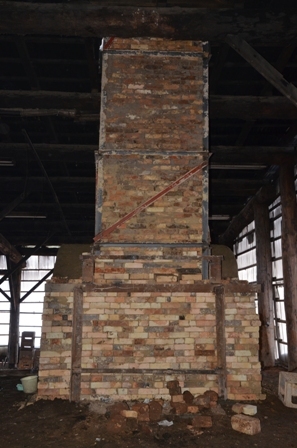 Chimney used to be installed in the hole. 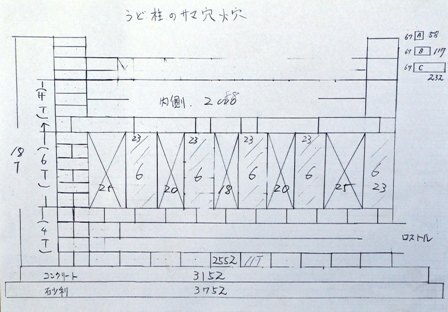 (upper right side of the above picture). 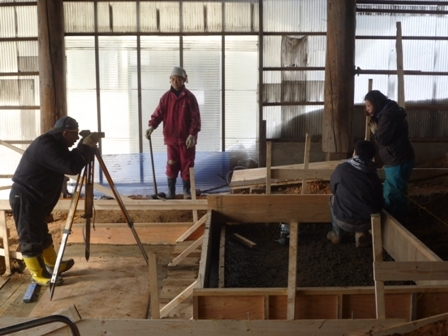 We started basement planning in the morning. 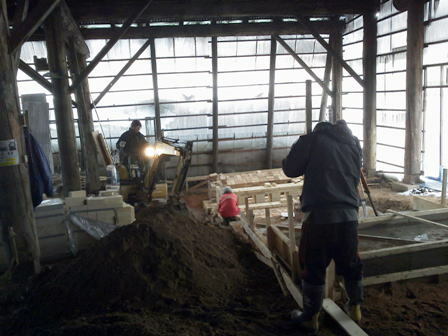 Excavation started from the afternoon. 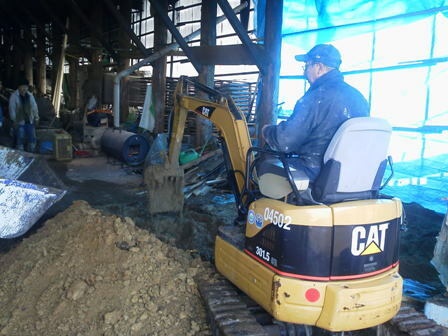 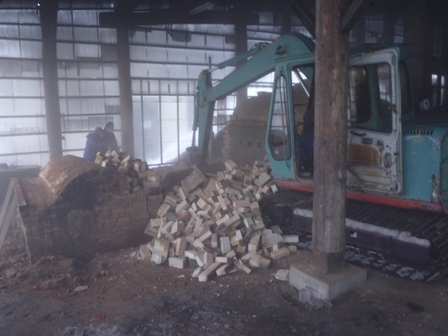 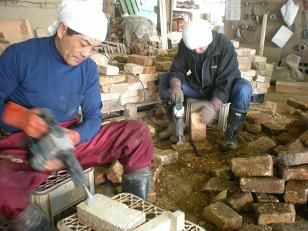 A master Potter, Ryoji, handled power shovel. 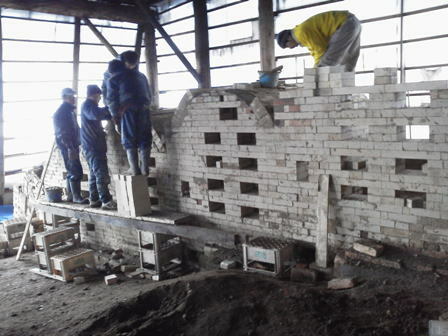 Fundamental kiln construction which was placing of concrete to the firebox started. 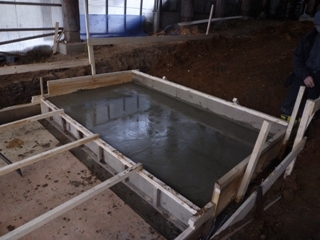 Making firm foundation is important for building the kiln. 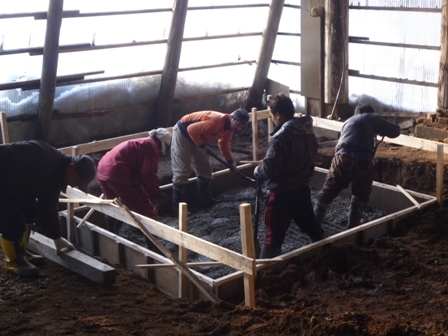 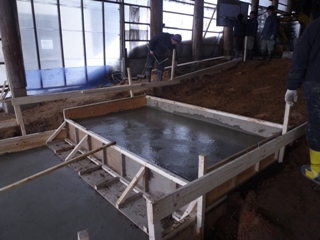 We use concrete for foundation of the kiln. 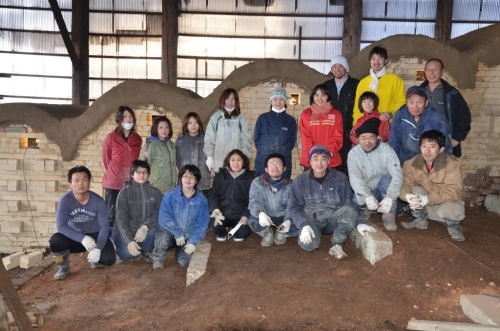 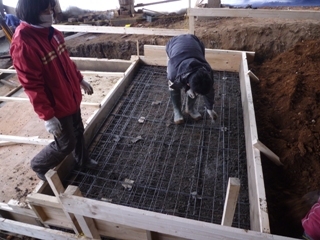 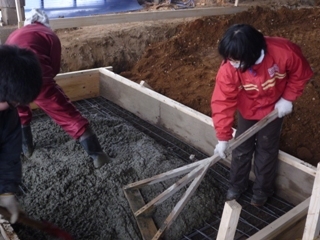 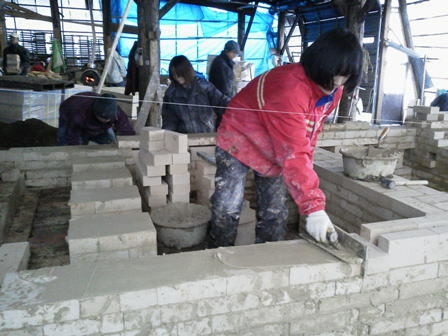 Risako the board chairperson,together with the female staff and male staff worked for concreting the foundation. 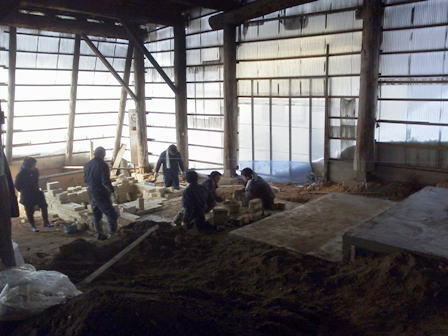 We worked for fundamental construction of the first and the second chambers this day. 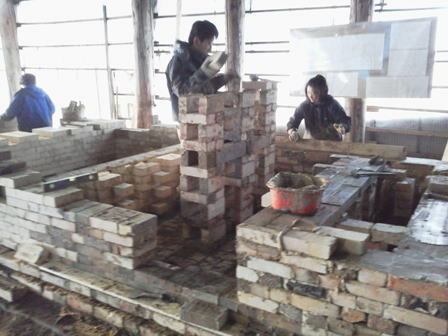 Bricklaying of the firebox started. 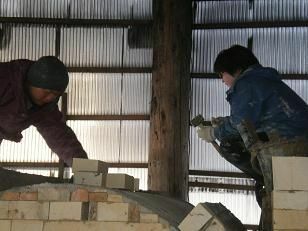 Work for building the kiln seemed to be going well this day. 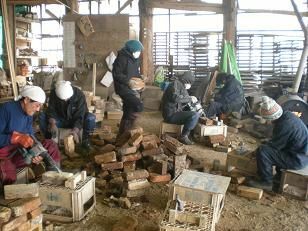 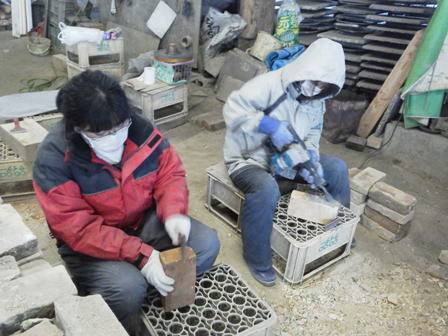 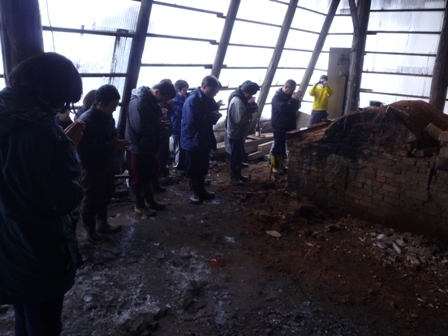 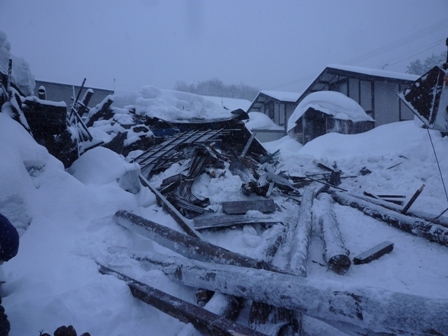 However, a part of kiln-equipped pottery workshop was collapsed under the weight of snow! 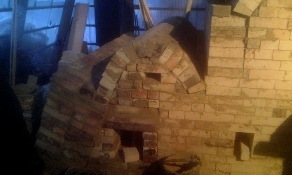 In spite of having such an accident, work of building the kiln was going well. 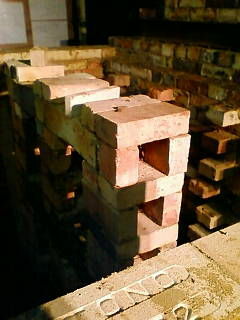 We reused bricks which removed from the old kiln after cleaning those well. 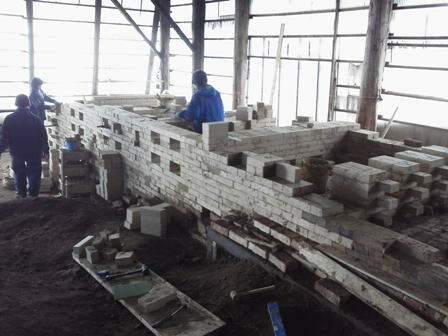 Bricks for the firebox were already laid up this much as seen in the picture. 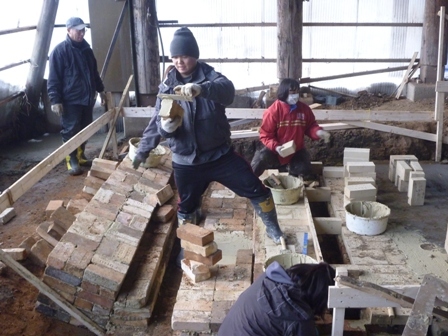 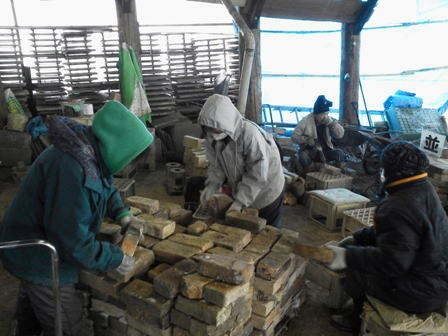 We reused bricks which removed from the old kiln after cleaning well. 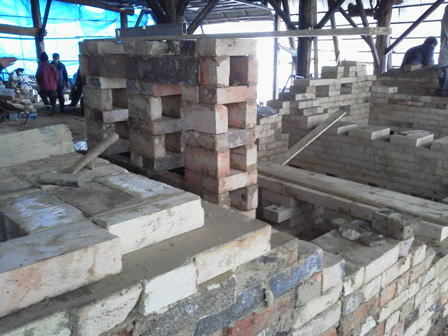 Bricklaying work was going well. 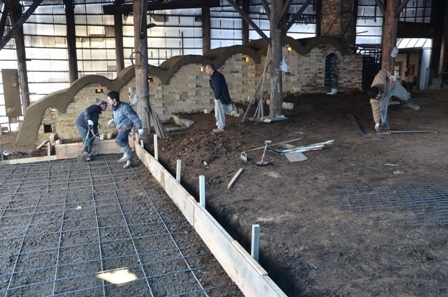 The walls of the first chamber being built just a little . 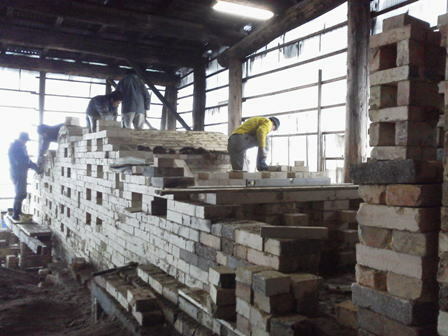 The walls of the first and second chambers were being built gradually. 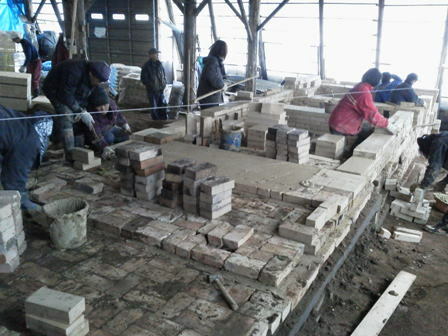 Constructing kiln floor team started working simultaneously with the wall team. 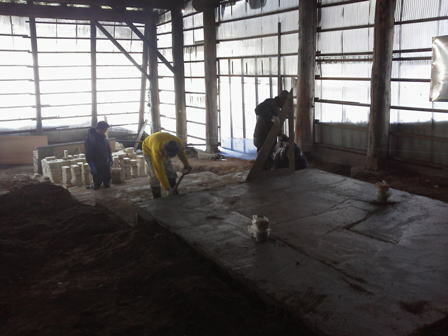 The kiln floor team were progressing ahead. 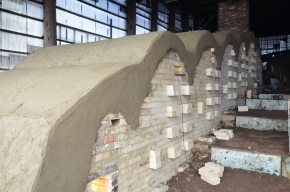 The kiln was getting close to the shape in accordance with the design. 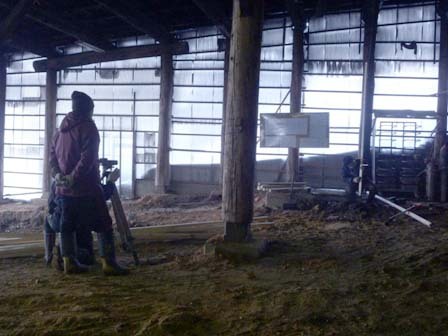 This is our fashion to bear the cold and dust. 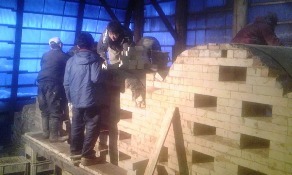 The walls being built were getting higher. 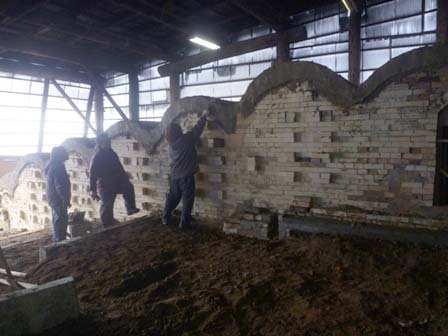 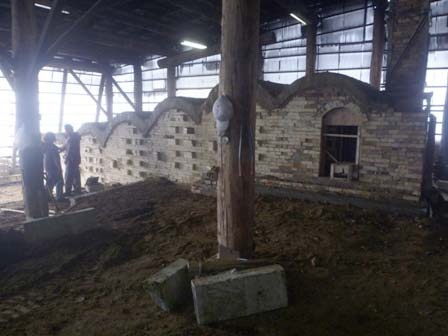 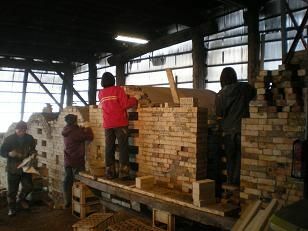 Construction of the first, the second, and the third chambers’ walls of the kiln were completed! 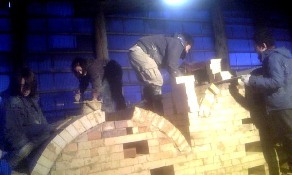 Kiln construction was going on even after getting dark. 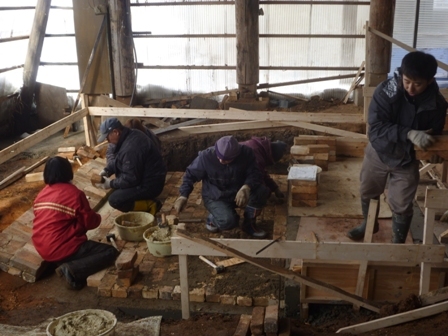 Building the kiln was important work, so staff was receiving detailed directions. 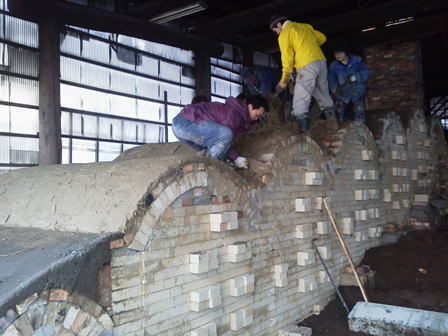 The arch of the firebox under construction was like this shape as seen in the picture at this point. 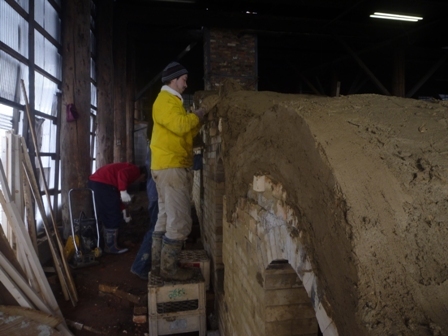 Building the arch on top of the kiln was steadily making progress. 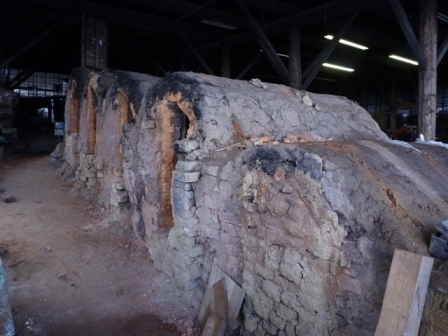 The picture of the above right side was the view of the kiln from the backside. 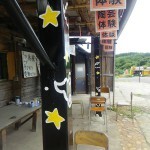 The picture of above left side was the view of the arch from the entrance. 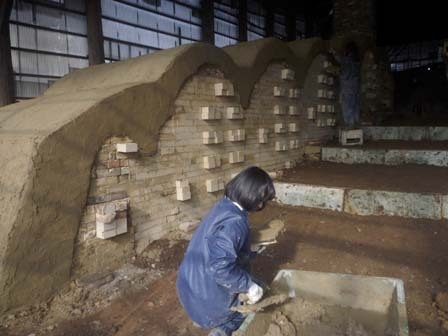 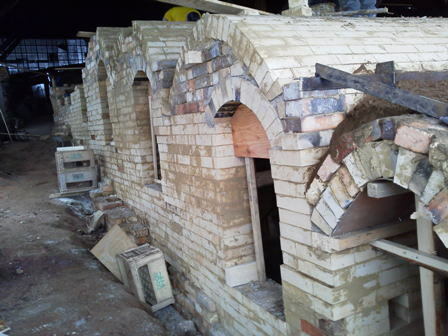 The roof was being built one after another, and the kiln was close to completed shape. 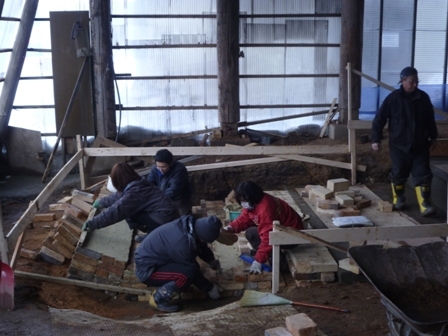 Building the roof of the third chamber was finished. 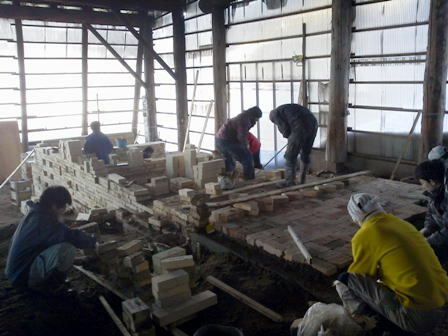 Bricklaying on the fourth chamber was finished, so building the kiln work was getting near completion. 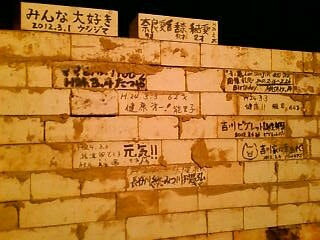 Memorial bricks which our customers wrote messages on those were piled up. 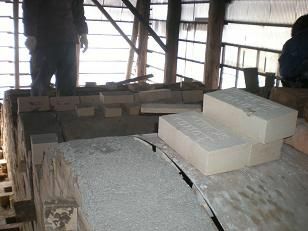 We are going to use this kiln having these messages with taking good care. 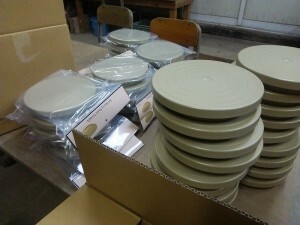 We will be happy to welcome you anytime, so please visit us anytime to see the kiln. 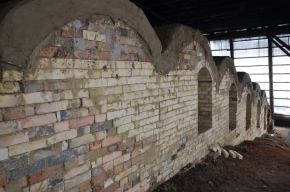 This was an empty room between the last chamber and chimney in the kiln. 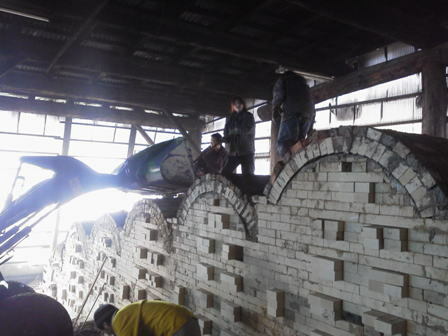 Inside the kiln was getting complicated as seen in the picture. 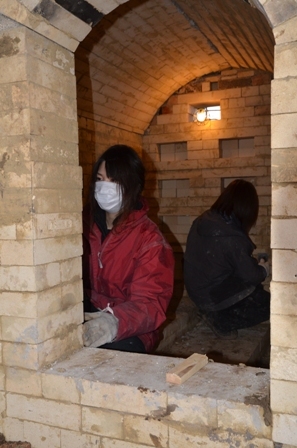 This was the first attempt that built the empty room between the last chamber and chimney in the kiln, so we were looking forward to using the kiln after built to see how it works. 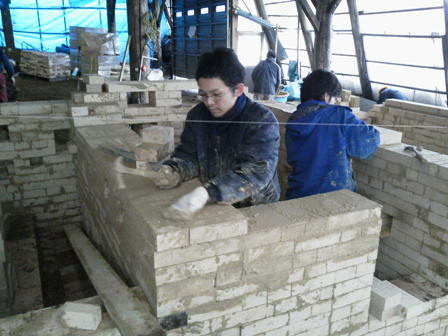 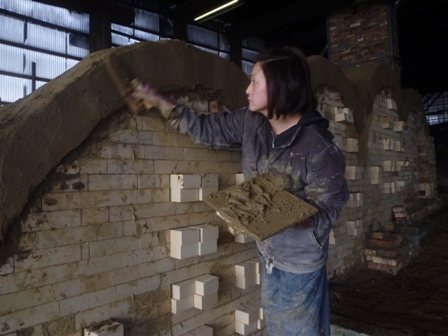 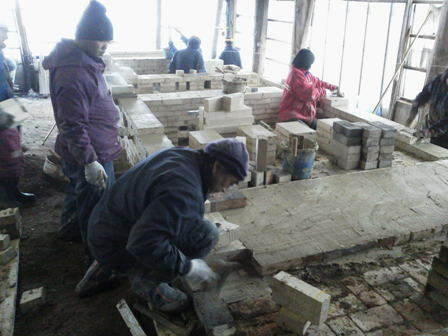 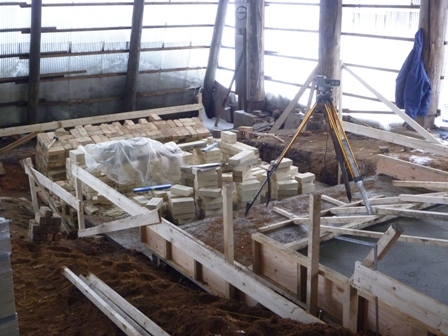 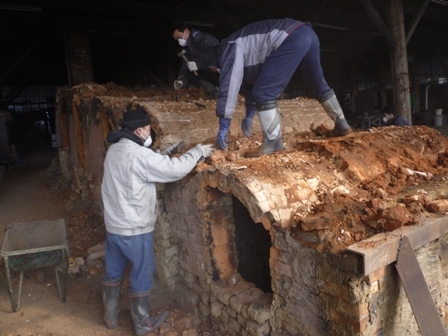 Bricklaying was piled up until about the 160cm (about 63inches) high. 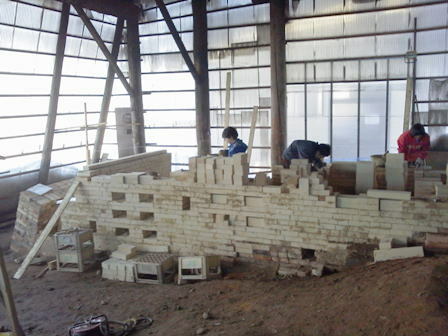 Building the kiln would be the final stage next day. 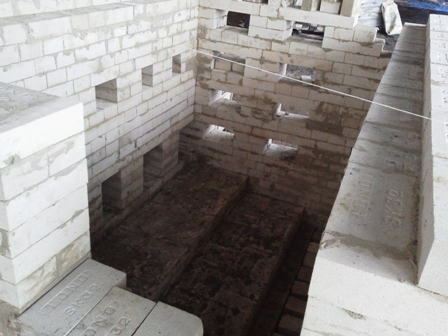 The roof of all the chambers seemed to be finished building next day at this point. 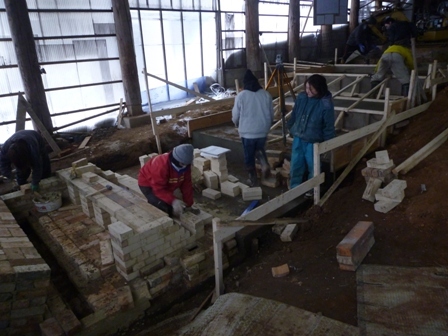 Work of building the kiln was progressing with the fast and good pace. 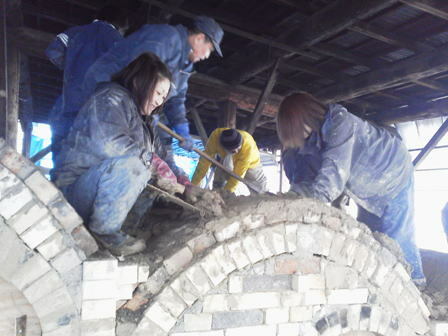 All of members engaged in building the kiln were working together this day, so that building the kiln work was making good progress. 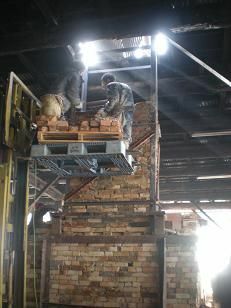 The chimney being built was getting much higher as seen in the picture. 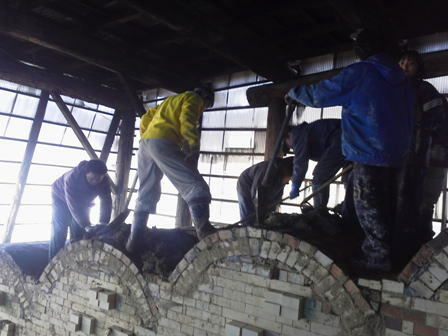 Cleaning bricks taken from the old and broken-down kiln was almost finished. 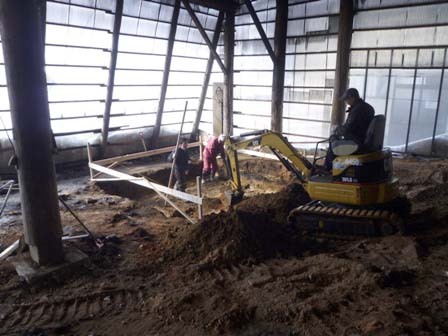 Digging a hole in the ground and agitating excavated ground with the heavy machinery. 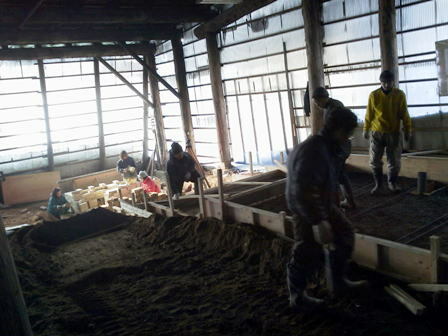 Preparing dirt to cover the kiln. 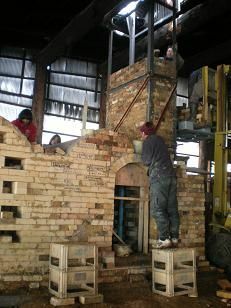 Many staff were getting on the top of the kiln and already making ready to pile up dirt on the kiln to cover the kiln.. 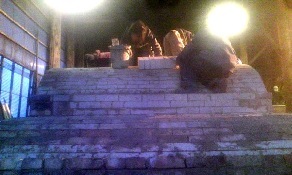 The bricks on the roof were double-layered. 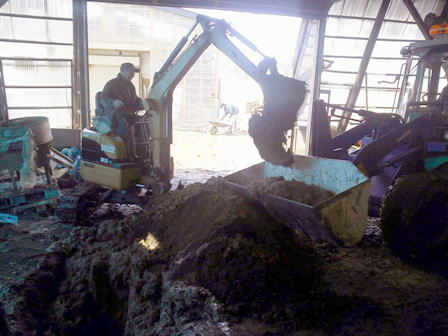 Moreover, we cover the kiln by dirt for moisture retention. 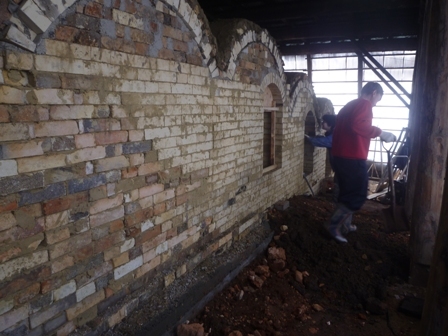 Dirt was daubed to the upper of the kiln. 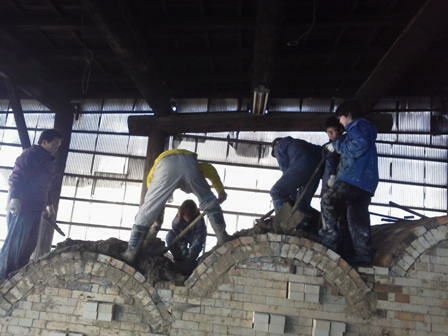 The roof was being built sturdily, so the kiln was impregnable even some staff were getting on the roof together as seen in this picture. 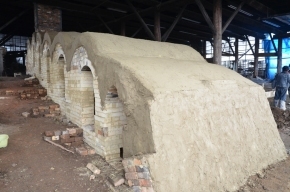 Dirt was daubed on the top of the kiln, and building the kiln was almost completed. 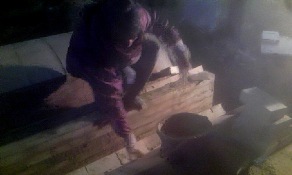 Steps were made to make working around the kiln be easier. 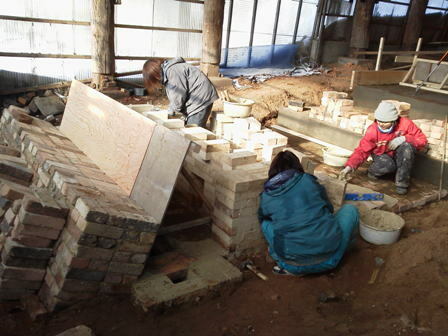 Building the kiln would be completed after added the finishing touch next day. 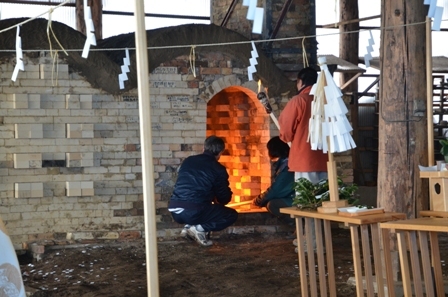 We added the finishing touch to the kiln this day. 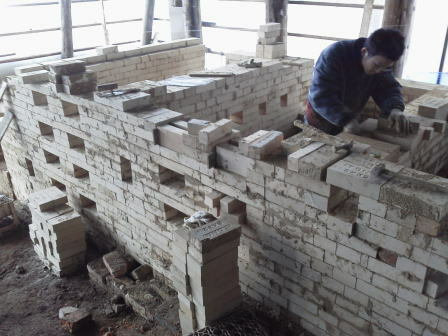 Removed excess mortar from the inside the kiln, and a joint filling was performed. 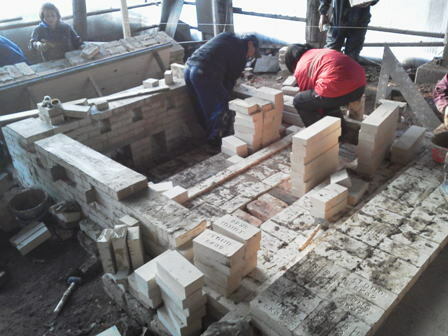 The finishing work was being done very carefully. 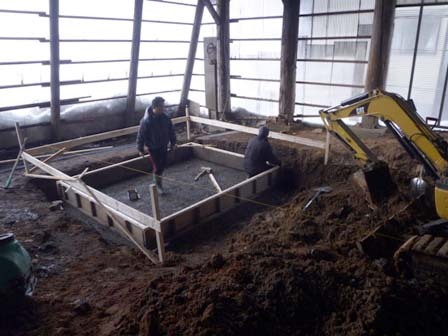 Some staff placed concrete as final for forklift work. 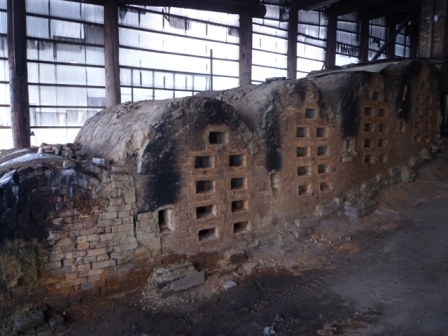 The kiln viewed from the side which had the hole to put charcoal inside the kiln. 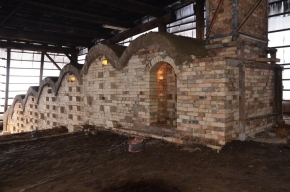 The kiln viewed from the kiln entrance side. 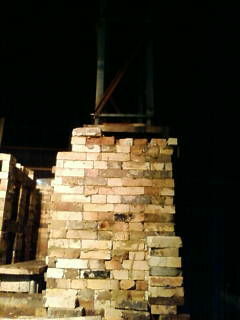 Building a chimney was completed. 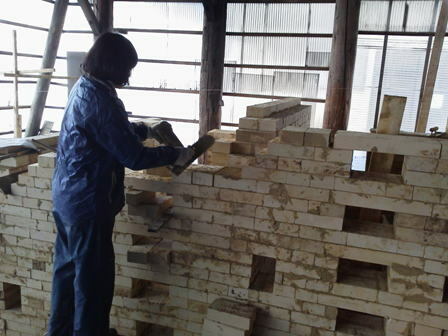 The height of the chimney was seven meters (about 275 inches). 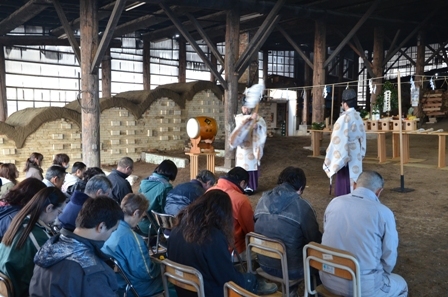 We had a consecration ceremony for the new kiln this day. 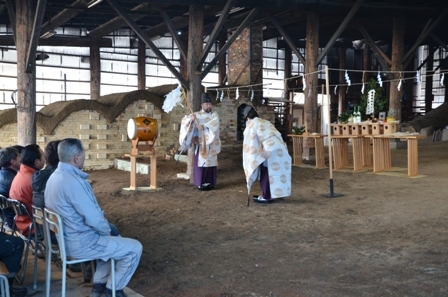 Sacred atmosphere which was different from during working was created at the kiln site once the ceremony started. 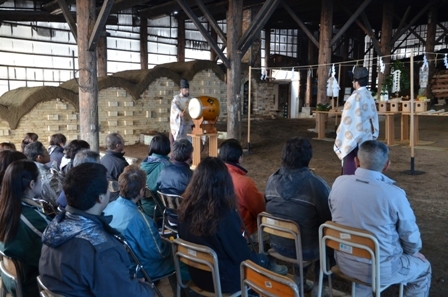 The first firing at the new kiln was performed as a part of the ceremony. 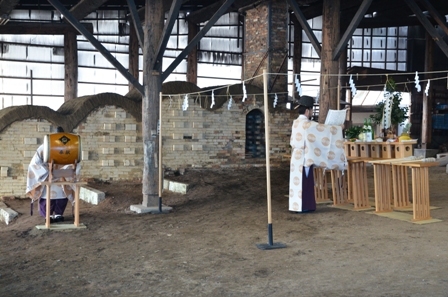 Master Potter, Ryoji, and all of staff prayed for the new kiln.